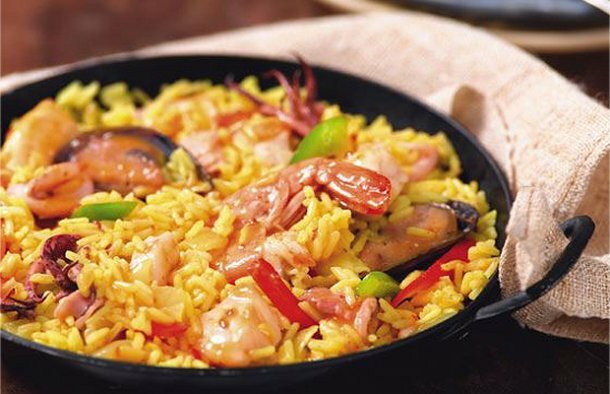 This delicious Portuguese style seafood paella recipe is very popular and the best part is you can add your favorite seafood to it. In a deep heavy-based frying pan, heat half of the olive oil and add the chopped onion, garlic, bell peppers and saffron. Fry until onions are translucent, add the rice and salt and fry for 5 minutes stirring occasionally. Add wine, broth or water and allow rice to simmer for 10-12 minutes. While the rice is cooking prepare the fish and seafood. In a large skillet heat the rest of the olive oil and grill the white fish for about 3 minutes. Add the shrimp and the other seafood and fry for 3 to 5 minutes or until the shrimp changes color. Add the piri piri sauce and lemon juice and cook for another 2 minutes. Add the fish and seafood to the rice and gently toss to mix through. Garnish with coriander and lemon wedges and serve. 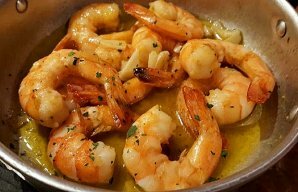 This Portuguese shrimp with garlic recipe is the easiest to make and the most flavor packed shrimp you will ever eat. 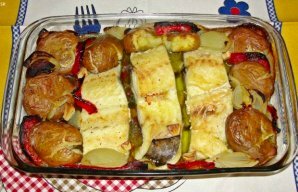 This is a Portuguese cod lagareiro recipe that will get two thumbs up from everyone, enjoy. How to make Portuguese steamed clams.